The post-credits scene to Doctor Strange is unusual in the Marvel Cinematic Universe in that it is recreated nearly perfectly in a later movie. The post-credits scene involves Doctor Strange (Benedict Cumberbatch) talking to Thor (Chris Hemsworth) in the Sanctum Sanctorum in New York City. The conversation is revisited and expanded upon in Thor: Ragnarok. 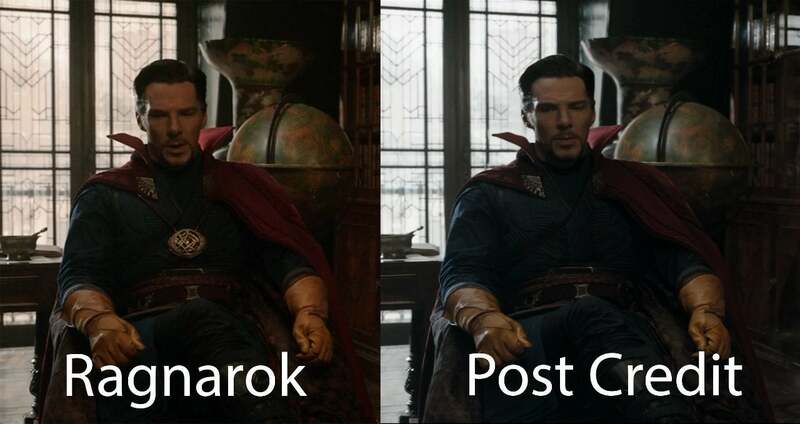 However, there are some differences in Strange’s appearance between the two movies. Most of the difference is in colorization, with Strange’s clothing appearing more vibrant. This could be attributed to directors Scott Derrickson (Doctor Strange) and Taika Waititi (Thor: Ragnarok) wanting the scene to fit seamlessly into the looks of their respective movies. In Doctor Strange, Wong warns Strange that keeping an Infinity Stone around his neck may not be the best idea. Strange seems to heed Wong’s advice and puts the Eye of Agamotto safely away in the Sanctum Sanctorum. However, its back around his neck in Thor: Ragnarok. It isn’t unreasonable to think that Strange would want his most powerful relic nearby when entertaining two gods of Asgard, and so took the Time Stone out for this special occasion. As to why it wasn’t there in the post-credits scene, some fans on Reddit had some fun speculating that Strange had to learn this the hard way and that his first encounter with Thor and Loki didn’t go well. As such, Strange then used the Time Stone to reset the encounter and try again, similar to how he handled Dormammu. Thor: Ragnarok currently has an 84.51 ComicBook.com Composite score, the seventh-highest score of any comic book movie. Thor: Ragnarok also has a 4.23 out of 5 ComicBook.com User Rating, making it the fourth-highest rated comic book movie by ComicBook.com Users. Let us know what you thought of Thor: Ragnarok by giving the movie your own personal ComicBook.com User rating below. Upcoming Marvel Cinematic Universe movies include; Black Panther on February 16th, Avengers: Infinity War on May 4th, Ant-Man and the Wasp on July 6th, Captain Marvel on March 8, 2019, the fourth Avengers movie on May 3, 2019, the sequel to Spider-Man: Homecoming on July 5, 2019, and Guardians of the Galaxy Vol. 3 in 2020. Avengers: Endgame Post-Credits Scene Not Included In Early Screenings, But Will One Be Added?